Steve Amstrup carries polar bear cubs back to their mother after they became separated. 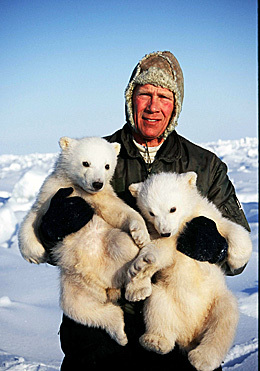 He is widely recognized as one of the world leaders in polar bear research. Steve Amstrup, a senior scientist with Polar Bears International and an adjunct professor in the University of Wyoming's Department of Zoology and Physiology, has been selected as a finalist to receive the Indianapolis Prize. Presented by the Indianapolis Zoo, the $100,000 prize recognizes outstanding achievement in animal conservation. Amstrup is among six finalists, narrowed down from 28 nominations. The award will be presented at the Indianapolis Prize Gala scheduled next September. Widely recognized as one of the most important and influential scientists working on polar bear conservation, Amstrup led the international team of researchers whose reports became the basis for the 2008 listing of polar bears as a threatened species under the Endangered Species Act. "Steve Amstrup has provided enormous leadership in polar bear conservation through his work with bears in the field, with scientists from many disciplines, and with decision makers at the highest levels of government," says Eric DeWeaver, program director of the Climate and Large-Scale Dynamics Program at the National Science Foundation. "His work on polar bear conservation is tremendously important -- not only for polar bears but for the entire Arctic ecosystem -- and for the multitude of species around the world that are now at risk from global warming." An adjunct professor at UW since 2006, Amstrup's first link with UW was when he developed some research projects in Alaska with Merav Ben-David, now a professor at UW. He has co-advised Ben-David's graduate students and helped secure funding for student projects. He also worked with Ben-David and UW Zoology Professor Hank Harlow to assemble a collaborative project involving eco-physiological challenges facing polar bears in a declining ice environment; has given guest lectures to both faculty and student groups at UW; and has visited with several students about the life of a field research biologist. "My interactions with UW are always energizing experiences that I thoroughly enjoy," Amstrup says. "I value the privilege I have been given to serve UW in this way."